The ANC Youth League has strongly condemned the death of the deposed dictator Gaddafi, hailing him as an “inspiration to many freedom fighters across the continent and the world”. Cosatu has also referred to battered images of the dictator before his death as “triumphalism” and “an example of imperialist barbarism at its worst”. Zuma himself has also opposed the killing of Gaddafi, saying he believes the dictator should have been arrested as he had a warrant out for his arrest by the International Criminal Court (ICC). The very same warrant that Zuma as well as the rest of the African Union refused to recognise. The ANC had offered Gaddafi asylum even with the arrest-warrant in place so their statements are blatantly hypocritical. 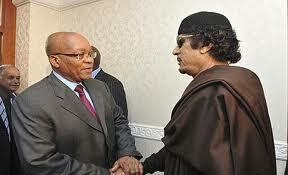 It's also quite suspicious that a team of South African mercenaries were involved in trying to help Gaddafi escape. Even more suspicious is that one of these mercenaries is apparently a South African 'spy'. He is now in a Libyan hospital and has stated that their convoy during the attempted extraction from Sirte was overwhelmed by rebels and Nato air support forcing them to escape and leading to at least two SA mercenary deaths. The question is: what was a South African agent doing with these mercenaries? The response of the ANC has been that the SA government did not “officially” support such an operation. The wording in their statement is quite telling since why would they have needed to add the word “officially” into their response if they were opposed to the attempted extraction? This is not the first time that SA mercenaries were involved in an “extraction” in Libya, they have also helped Gaddafi's daughter and other family members escape to Tunisia. Possibly even the same team that tried to do the same for Gaddafi himself. Documents were also discovered indicating that the SA government were in negotiations with the Gaddafi regime after the initial uprisings in order to provide weapons as well as military advisor's and training personal. These negotiations however collapsed after the no-fly zone was declared. In February this year a massive arms cache was discovered in Kimberly which seems to have received a total media blackout locally. According to a SA Police Service spokesperson two opened containers were discovered at the local railway station containing: “18 tons of explosives, missile warheads, 20 tons of ammunition, 9mm pistols and AK47s”. The containers were from Durban, possibly arriving from the port and were headed to another destination but the police would not say where. Though whether the arms were intended for local use of course leads to other questions especially which group/s they were intended for. But it is strange that the government would keep quiet about the discovery of such a massive arms cache, the most shocking contents being the missile warheads. And why was there a media blackout? With regards to the ANC's sympathies for the “gruesome killing” of Gaddaffi, the sight of a corrupt dictator covered in blood and violently killed by his own people with support from the West is probably not one they wish to dwell on too much.